Last Thursday saw the opening of a particularly special exhibition at the Logan Center: the Department of Visual Art’s annual B.A. thesis exhibition. 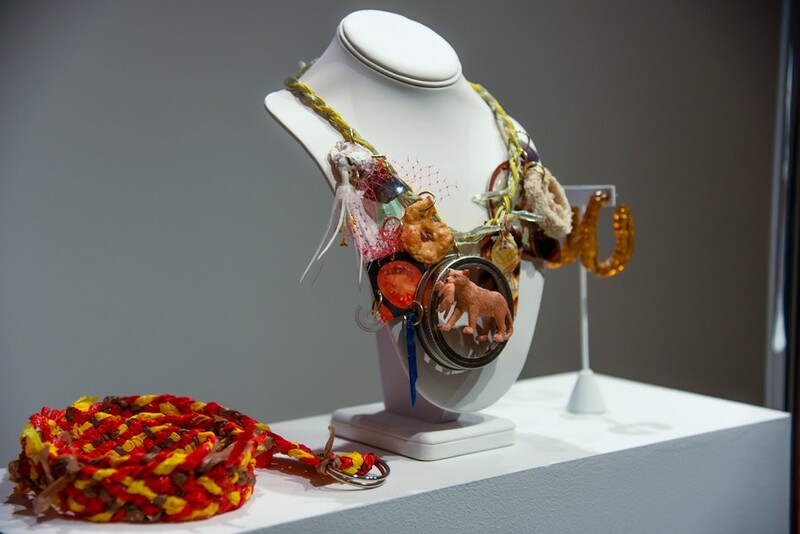 Every spring, the thesis exhibition highlights the work of undergraduate visual arts students who elect to enter the time-intensive and laborious studio track in their fourth year. Amidst sumptuous platters of food and throngs of eager gallery-goers, 10 students unveiled their new work in the aptly titled exhibition, New Work. The exhibit matches the surprising depth of the title. An incredible and incredibly diverse array of artwork is on display, ranging from more traditional mediums like painting, photography, and sculpture, to fashion, installation, and even virtual reality. Using her second major in computer science, Xu employed this final medium as part of her exploration of how technology, design, and fine art intersect materially and spatially. She encourages students interested in visual arts not to shy away from science, and vice versa. Her work is a testament to the fruitfulness of the synergy between these two often-separated fields. The exhibit employed creative materials. Across from the invisible world of Xu’s exhibit was a much flashier spectacle. Sartorial and satirical, Aleksandra Majka’s “Ready-To-Wear” features models dressed in aesthetically pleasing but otherwise extremely uncomfortable and operationally impossible outfits, ranging from a dress made of breakable mirrors to a bodysuit covered in pins. Enticing and menacing, Majka’s work takes the maxim “beauty is pain” to its absurdist extreme, challenging viewers to question how much they are willing to suffer to look good. Drawing inspiration from designers like Iris van Herpen and Alexander McQueen, Majka’s work is also influenced by her time in the studio track, which pushed her toward new experimental horizons that ultimately refined her art. In enormous font outside the gallery is the pun, “The New Work Times.” Indeed, much like a contemporary newspaper, the show is a media minefield bursting with a variety of themes and styles. Adjacent to Majka’s futuristic avatars is Grace Hauck’s photography exhibit. 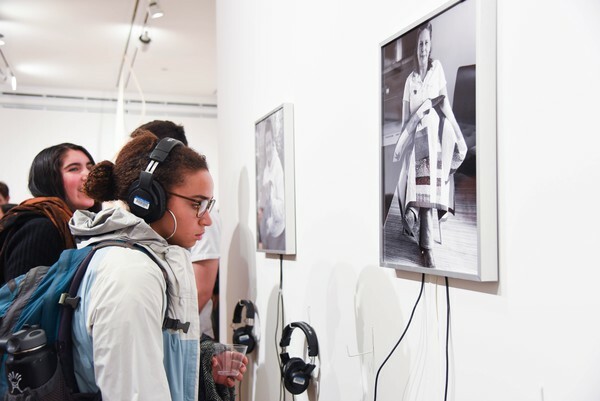 Part of an ongoing project to gather stories of individuals’ experiences with Chicago law enforcement, Hauck has two photos mounted on her portion of the gallery wall with corresponding audio files of the interviews conducted with their subjects. Noise-cancelling headphones allow visitors to retreat from the hustle and bustle of their surroundings and dip into the worlds narrated by Hauck’s interviewees: two women recounting their time as police officers and the institutional sexism that hindered but did not thwart them. 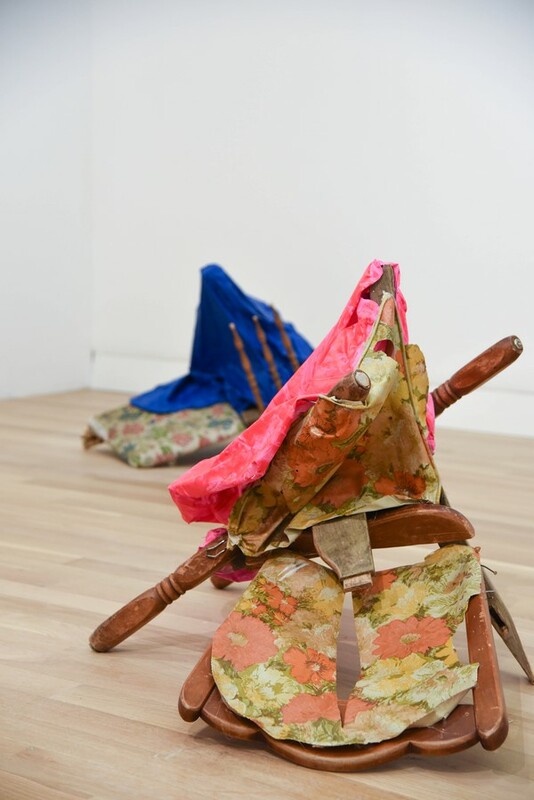 One might reasonably expect some difficulties to arise in coordinating a show as large and variegated as New Work, but any such difficulties are hard for the viewer to detect. In many cases, the anticipated challenge of fitting into the gallery space resolved itself serendipitously. Luke Clohisy’s sculptural “Projections” intercedes between two series of Bilby’s paintings, creating a nice conversation; many participants in Xu’s virtual reality piece reported that the sounds from Sean Allen’s adjacent “eek” informed their experience of the virtual space. This is not to say, however, that assembling New Work didn’t have its fair share of difficulties. As diverse as the art in New Work may be, the artists have something in common—an unremitting appreciation for the Department of Visual Arts. “Professors and other mentors would really push me to articulate what concepts I was pushing and what deeper intellectual meanings are behind the work,” reflected Xu. “Really being forced to think about it made me grow as an artist.” Bilby noted that visual arts education doesn’t just come from the outstanding professors but from the group of students attracted to the department: “Learning about the artwork of my peers has been one of my favorite and most rewarding aspects of my time in the visual arts major.” Beyond art, students like Julia Huang cited their involvement with DoVA as a source of inspiration for overcoming fears of failure and engaging in endeavors at which they might otherwise balk. Though its title may be modest, the pieces presented in New Work are captivating. The final line of the exhibition’s four-line description proclaims, “I love New Work.” So do we. New Work will be on display in the Reva and David Logan Center for the Arts until April 22. Karen Xu’s virtual reality piece “Interior Exterior” is available for experience every Tuesday through Sunday from 1 p.m. to 6 p.m.